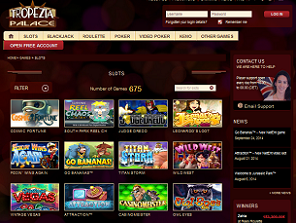 If you are looking for the greatest variety of games, Tropezia Palace casino is the place where you go to. NetEnt, Betsoft, Rival Gaming, Microgaming, these are just few of Tropezia Palace software providers. Licensed in Curacao, the casino is operated by Fitzgerald Industries and has been around since 2010. Currencies: Euros, USD, GBP, Norwegian kroner, Swedish kronor. Featuring a black and dark red design, Tropezia Palace doesn’t impress when you first look at it. The website is simple and friendly, with the links to the main games categories placed at the top and easy to locate. One area where they do impress is with their games variety. Tropezia has a great mix of online slots, from multiple well known developers, so you don’t have to try out half a dozen different casinos in order to experience them all. I especially enjoyed the titles from Microgaming, Rival and Net Entertainment, but on top of those they also offer games designed by Leander Games, BetSoft, NextGen and Saucify. Among the most popular slots you can find, Jurassic Park, Cosmic Fortune, Go Bananas and The Dark Knight. These are just personal preferences though, with their roster including hundreds of different slot machines with a lot of variety when it comes to their themes. The array of other casino games such as Blackjack, Video Poker, Roulette is as wide as with slot machines: over 90! video poker games, 34 Blackjacks, Roulette, Poker, Video Poker, Keno and every possible casino game. A total of 37 progressive jackpot games are offered, including the famous Mega Moolah, Major Millions and King Cashalot. Tropezia Palace is built with players in mind and not just for one time visitors. Their welcome package is not spectacular, but you will be compensated further down the road with various promos, such as The Gentlemen’s Night, Ladies’ Night, Thank God It’s Friday, Tropezia VIP Club and more. All contribute to the experience and insure that you won’t be bored. On your first deposit you can get a 100% up to 100. The wagering requirements are 20x Bonus+Deposit, which is the industry average. One of the drawbacks of Tropezia is that the range of deposit and withdrawal methods is slightly limited, but it does cover all the popular methods. You can deposit using: MasterCard, Visa, Maestro, American Express, Visa Electron, Diners Club International, Skrill, Neteller, Paysafe Card, Ukash. To withdrawal funs you can use: Bank Wire Transfer, check, Neteller, Skrill. Maximum withdrawal amount per month is 10,000 €/£/$, not including progressive wins. The minimum withdrawal is 50 €/£/$. The processing time is up to 3 days, which is a bit below average. Tropezia is using a 128 bit SSL encryption whenever important information is being transmitted. This casino has already been around for a couple of years and it has managed to get a good reputation going, being known as fair to their players. We didn’t find any players complaints and it has positive reports on all major dispute sites. Unfortunately, at the moment, you cannot play at Tropezia Palace on any mobile device. If you were looking to play on your mobile, please visit our Best Mobile Casinos section. Tropezia Palace is a casino that’s worth checking out for their variety of games alone, but it’s not the only reason. They have a focus on existing players with their multiple promotions, probably a reason why their initial bonus is not that impressive. Overall, I was quite happy with the experience I got from them, so I’m going to recommend it to you as well.